Whether you have a retail storefront, restaurant, hotel, services, or a MOTO business, your customers expect you to accept their preferred method of payment. PayTech Solutions can help you easily setup a merchant account for the customer payment solution best for you! The entire process will take just minutes of your time, and you'll be up and running in a matter of days. Whether you are a start-up company, existing business, or a Fortune 500 company, we will provide the best merchant processing solution for you. You're automatically approved, regardless of credit! The PayTech Solutions application process is fast and easy. You can submit an application via fax or by meeting with a sales representative at your business location. Your application will be approved almost immediately, your account will be activated, and, if you're buying or leasing new terminal equipment, it will arrive in just days. 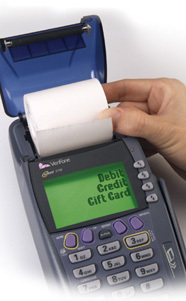 Our processing equipment delivers the speed, convenience, and security of electronic payment to millions of businesses serving merchants in stores and for mail order or telephone orders.